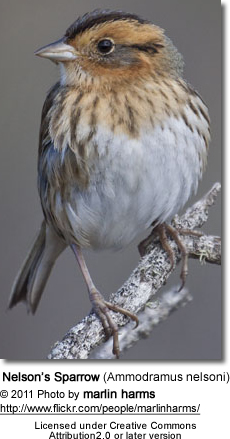 The Nelson's Sparrow (Latin: Ammodramus nelsoni) is a small sparrow. 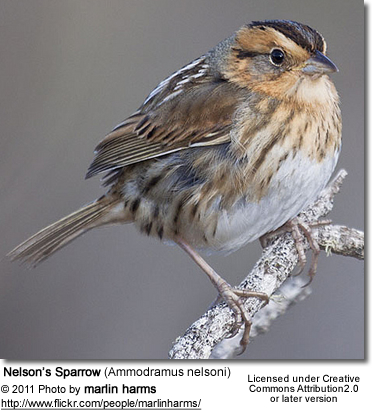 This bird was named after Edward William Nelson, an American naturalist. 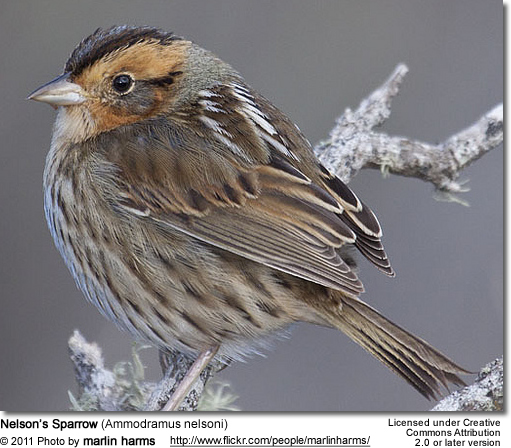 Formerly, this bird and the Saltmarsh Sparrow were considered to be a single species, the Sharp-tailed Sparrow, because of this it was briefly known as Nelson's Sharp-tailed Sparrow. Adults have brownish upperparts with grey on the crown and nape, a cream-colored breast with light or indistinct streaking and a white throat and belly; they have an orange face with grey cheeks and a short pointed tail. They forage on the ground or in marsh vegetation, sometimes probing in mud and eat mainly insects, aquatic invertebrates and seeds. Their call is a raspy trill, almost a mechanical sound. It may be given in flight during the nesting season. The sound has been likened to a drop of water hitting a hot fry pan.